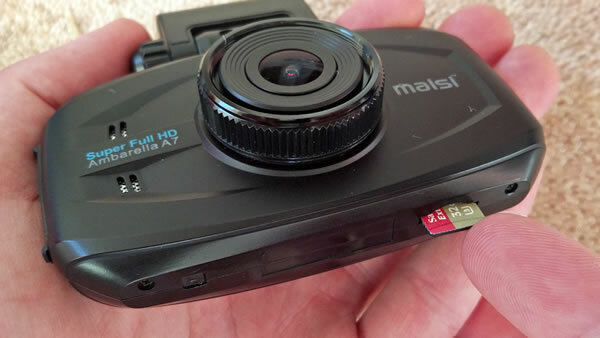 The Maisi Smart is our favourite dash cam in the Mid-Range price bracket. 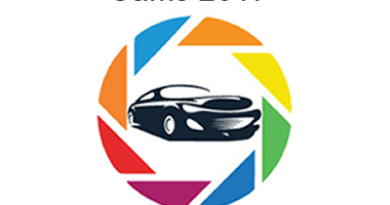 The video quality and features can outshine car cams double the price, while the customer support is second to none. 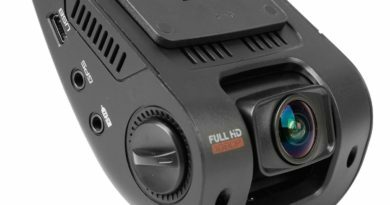 This dash cam can record at Super HD 1296p (greater than Full HD 1080p) with a fantastic 170 degree wide angle lens, providing excellent footage day or night. With it's fantastic video quality and GPS feature, we give this camera the number 1 position in terms of value for money. This Maisi Dash Cam comes with both a suction and adhesive mount, giving you the option of a temporary or permanent set up. Accessing the menus and transferring files are both easy and intuitive. Most cameras are unable to store footage without a microSD card, so you will need to purchase one before setting anything up. The Maisi Smart accepts microSD cards up to 32GB, and we recommend a Class 10 card as they guarantee a write speed of at least 10MB/s, a requirement for 1080p video. To make the most of this cameras superior 1296p resolution, we recommend a 32GB card with a write speed of around 20mb/s (SanDisk Extreme). Our recommended cards for this dash cam are listed below, but most Class 10 microSD cards should work. IT IS VERY IMPORTANT THAT THE ITEM IS DISPATCHED AND SOLD BY EITHER AMAZON OR THE MANUFACTURER. IF YOU PURCHASE FROM ANOTHER SELLER, YOU ARE LIKELY TO RECEIVE A COUNTERFEIT PRODUCT. Faulty or counterfeit microSD cards are becoming more common on sites such as Amazon and Ebay. For this reason, we recommend you always purchase from the manufacturer through Amazon, rather than a third party seller. 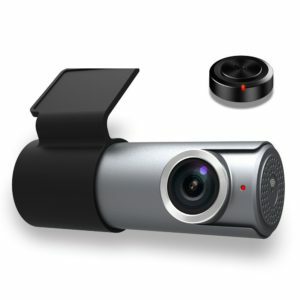 Super HD Recording - This camera is able to record in 2304 x 1296p, as well as Full HD 1080p resolution, giving you the best resolution current dash cams are able to offer. 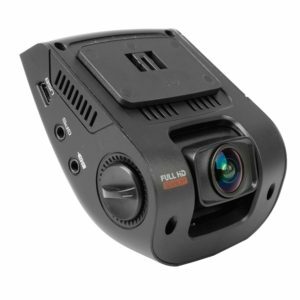 170 Degree Wide Angle Lens - The 170° wide angle lens covers the entire road, and allows you to pick up overtaking cars earlier than other dash cams. Being hit from the side is one of the most common road collisions, so this can provide you with extra peace of mind. Suction & Adhesive Mounts - One suction mount and two self-adhesive mounts are included in the box, allowing you to permanently fix the camera mounts to the windscreen, or temporarily use the suction cup. The permanent mount slightly increases stability of the footage when compared to a suction mount, and makes setting the camera up quick and easy. Loop Recording - The Maisi Smart records in loops of 1 min, 3 mins, or 5 mins. 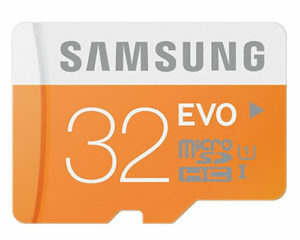 When the microSD card fills up, the camera will begin overwriting the oldest footage that hasn't been protected. G-Sensor - This accelerometer detects a change in gravity forces, and automatically protects the important loops. There are three sensitivity settings on this camera, low, medium, and high (you can also turn the G-Sensor off). If the footage locks when driving over potholes and speed bumps, you can reduce the sensitivity of the G-Sensor. GPS - The Maisi Smart comes with a GPS dongle, which can be plugged into the USB slot on the top of the camera. This will track your location and speed data, which you can play back via the provided GPS route software. Not only is this handy for tracking your own journey, but it will provide the insurance company with extra information if an incident was to occur. Note: Unlike Sat Navs, this GPS feature is not used for providing directions. Instead, it allows playback of your route on google maps, using a program such as Registrator Viewer. Advanced Features - The Intelligent Speed setting will warn the driver if they are over the selected speed ( 80 or 120 KMH), while the Driver Fatigue system plays a beep four hours after turning on, and every 2 hours after. There is also a Lane Departure Warning System, indicating when you are drifting out of lane, handy for long motorway journeys. On the back of the camera you will find four buttons. The top left button (OK) allows you to manually stop and start recording, and confirms a selection in the menus. The bottom left button (MENU) is used to access the Video Menu, and when clicked again goes to the Settings Menu. Recording needs to be stopped to access the menu. This button is also the Emergency Lock Button, and is used to manually protect the current file when recording. The top right (UP/EV) button allows you to navigate up in the menus, and changes the Exposure Value in recording mode (+ means brighter, - means dimmer). The bottom right button (DOWN/M) navigates down while in the menus, and when clicked during recording mode, will change between Video, Photo, and Playback modes. You will also find three lights on the left side of the camera. The top light will turn red when the dash cam is plugged in, indicating that the camera is charging. The middle button will be blue when the camera is recording, and the bottom button will light up green when the GPS module is plugged in and receiving a signal. On the left side of the screen, there is a single button, used to turn the camera on or off. The opposite side has two slots. The top one is for a HDMI cable, and allows you to plug the camera directly into a TV or monitor. Underneath you will find the USB slot, used for transferring video files to the computer via the USB cable included in the box. It is important to note that this slot will not power the dash cam. Instead. there is a separate USB slot on the side of the mounting bracket labelled DC IN . This is where the power cable should go. On the other side of the mount you will find a USB slot for the GPS dongle. Finally, there is a button on the bottom of the camera labelled "R". This small button can be pressed and held for a few seconds to reset the device, in the event that it freezes. There is also a slot on the bottom for the MicroSD card, which should be inserted with the text facing towards the lens, the gold teeth towards the screen. The very first thing you need to do is insert the microSD card. It is very important to insert the card before switching it on, to avoid damage to either the card, or the camera. 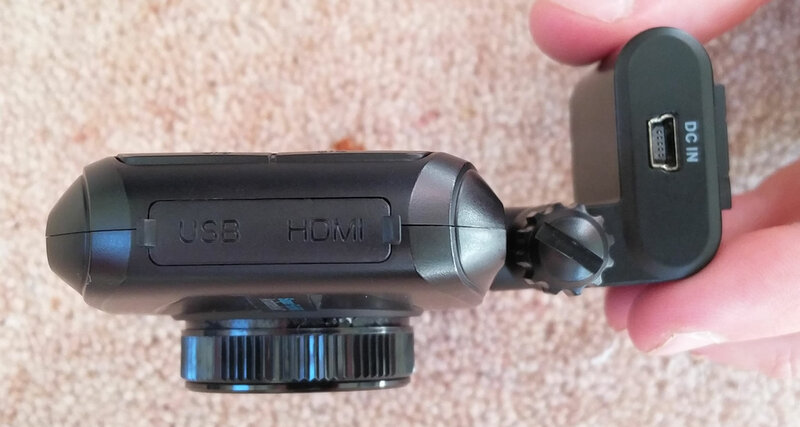 To begin, slide the suction cup mount to the top of the Maisi Dash Cam. You will need to wiggle the mount while pushing, as this can be difficult to get on. 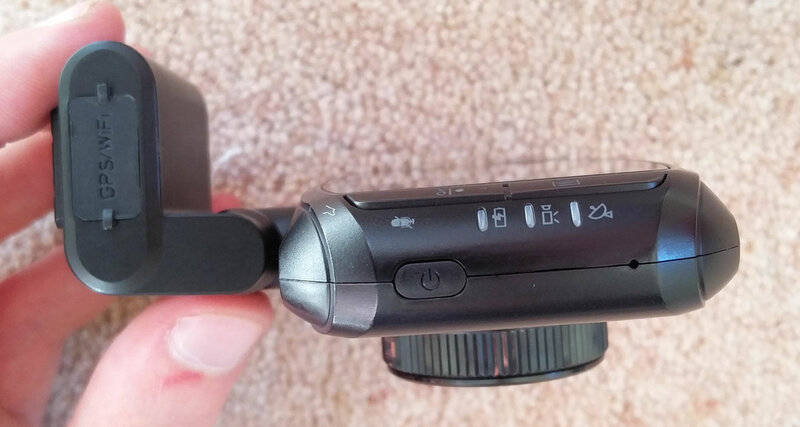 When the mount will not slide in any further, twist the knob on the side of the camera's mount (see images below). This will allow you to adjust the top section. Experiment with positioning of the dash cam on the windscreen until you find a convenient place. It is important to check the laws wherever you live, to make sure the dash cam placement won't be breaking the law. As long as the camera is on the passenger side, or behind the rear view mirror (and not obstructing any of the drivers vision) you should be fine. Remember to leave a small gap at the top of the windscreen, so the USB cable can fit above. 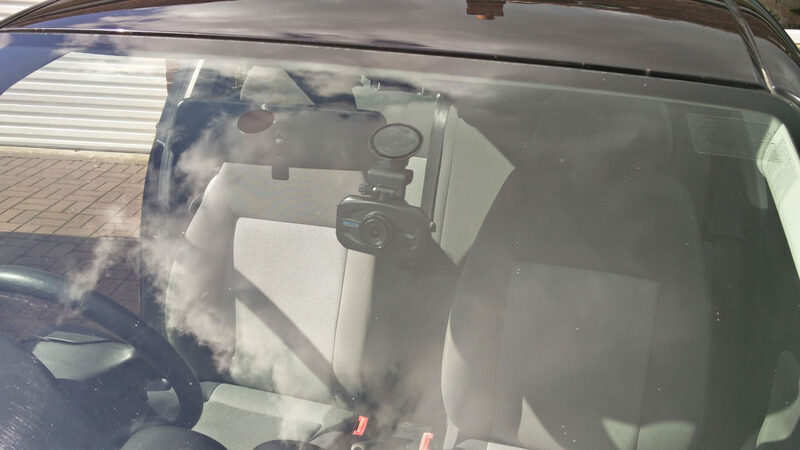 When you are confident of the location (and have left enough room above for the USB cable) attach the suction mount to the windscreen, by pushing it on and clicking the lever up. This mount is very easy to take off and readjust by simply using the lever, so spend some time getting the perfect position. Once this is done, simply use the knob to adjust the angle of the camera. Begin with the suction cup mount, and the Maisi dash cam. The suction mount should slide on from the side with diagonal corners (left hand side), to make the process easier. Slide the mount over the top of the camera. You will need to wiggle the mount with a decent amount of force to attach it properly. Push the mount all the way on, then take the camera to your car. When you are ready to attach the camera, push the suction mount on to the windscreen and flick the lever up. This will create a suction, holding the camera in place. You can twist the knob on the right hand side to move the camera forwards and backwards. Tighten this once you are happy. When you want to remove the dash cam, flick the lever down. After this, you can pull the tab (in the image above) away from the windscreen, to allow air back in to the vacuum. There should be very little force required to remove the suction mount from the car. To begin installation, take your camera to your car along with one of the self adhesive mounts. If you have any rubbing alcohol to clean the windscreen take it with you, but this isn't vital. We suggest attaching the mount to the camera before sticking it to the windscreen, so you will need to wiggle the mount while pushing, as this can be difficult to get on. When the mount will not slide in any further, twist the knob on the side of the camera's mount (see images below). This will allow you to adjust the top section. Experiment with positioning of the dash cam on the windscreen until you find a convenient place. It is important to check the laws wherever you live, to make sure the dash cam placement won't be breaking the law. As long as the camera is on the passenger side, or behind the rear view mirror (and not obstructing any of the drivers vision) you should be fine. Remember to leave a small gap at the top of the windscreen, so the USB cable can fit above. When you are confident of the location, use the rubbing alcohol to clean the section of the windscreen you will be using. After this, peel off the protective film and stick the dash cam and mount to the windscreen. Once the camera is stuck on well enough, you can slide the camera from the mount and continue firmly pressing it in place. Don't rush this step, once the adhesive mount is in place you will struggle to remove it. If you do misplace the mount or would like to fit the camera in a different car, there is another self adhesive mount in the box. The camera can be a little difficult to remove from the mount, so be careful not to use too much force and weaken the glue. Once this is stuck on, simply use the knob to adjust the angle of the camera. You will find two adhesive mounts in the box. Slide the adhesive mount to the top of the dash cam. If you are struggling, read through the steps for attaching the suction mount. Peel off the backing, and line the mount up with the windscreen. When you find a place you're happy with, firmly press down to stick it on. Take your time with this step, it will be difficult to re-stick the pad. After removing the camera, continue firmly pressing on the mount. The dash cam should now be easy to slide on and off the mount as you wish. The next step is to route the cables as shown in the slideshow below. You should aim to route the cable on the passenger side, so any dangling or loose wires won't distract the driver. Basically, your aim is to tuck as much of the wire away as you can. For most cars the cable can easily be tucked above the windscreen, then down under the rubber. It is worth noting, there may be an airbag underneath this panel, so you may want to take the wire down the side of the windscreen instead, using tape or cable mounting clips. You can then bring the wires across the footwell. Use sellotape to stick the wire under the glove box, or tuck it under the mats to avoid tripping over. For a better looking finish, you can click here to get some self-adhesive cable mounts. These will stick anywhere in the car, and allow you to manage the wires a lot easier. Now you can plug the GPS dongle into the dash cam. This is plugged in via the USB socket on the left side of the top of the camera, labelled as GPS/WIFI. The next step will depend on how your car delivers power to the 12V socket. Plug the 12V plug into the socket (the cigarette lighter receptacle), and look at the camera. If the camera isn't being powered, this means your car requires the ignition to be on for the 12V socket to be active. If this is the case, turn on the ignition, and wait for the camera to load. 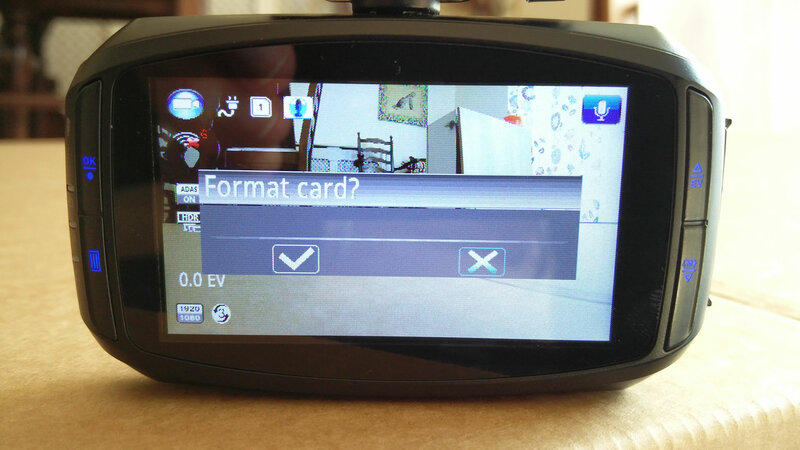 Now the camera has switched on, you should see the recording icon appear, indicating the camera has automatically started recording footage. If this isn't the case, or if you receive any sort of warning, you can visit the Product Questions Page to find assistance. The recording icon (red circle) is displayed whenever footage is being recorded. This will need to be stopped if you want to enter the menu. Whenever a clip has been protected by the G-Sensor or manually pressing the bottom left button, the camera will display a notification at the bottom of the screen. 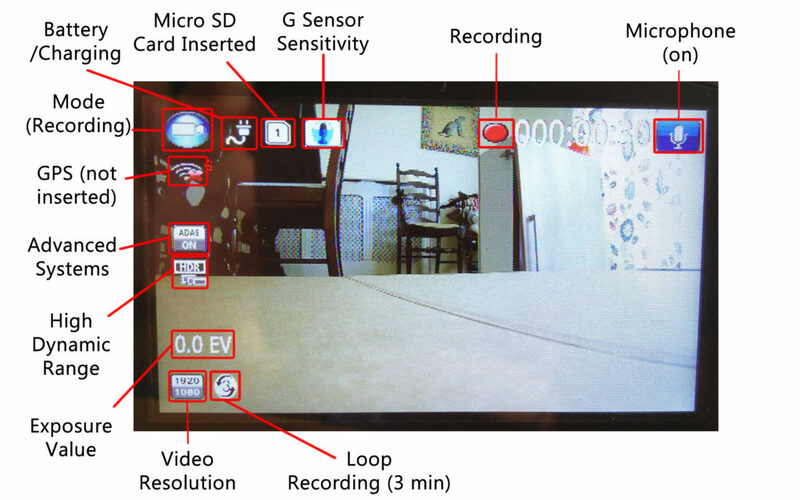 If Motion Detection is turned on, a red icon appears next to the G-Sensor icon at the top of the screen. If the time stamp is switched on, this information will appear at the bottom right of the screen. Important: With any first time set up, you should begin by formatting the SD card (make sure the card is empty as this will wipe all the current data). To do this, stop the current recording by pressing "OK" button. From here, you need to press the menu button twice to enter system settings. Use the "Down" button to navigate to the "Format" option, and press "OK". Use the navigation button again to select the tick, and click "OK" to confirm. The menus on this camera are easy to navigate. You enter the Video Menu screen by clicking the "Menu" button, and navigate using the Up, Down, and OK buttons. Pressing the "Menu" button twice will take you into the system settings. All the menu options are briefly outlined below. Video Resolution - Here you can decide the recording resolution. I recommend HDR 1920 x 1080, as this will offer fantastic quality with decent file sizes. It is possible to record at 2304 x 1296 resolution, but the large file sizes will fill up the microSD card quicker. It is also worth noting that you won't notice a difference with the 1296p recordings, unless you have a monitor with equal or better resolution (most monitors only support 1080p). If you value frame rate over video quality, it is worth considering recording at 720p@60fps. Image Quality - S. Fine / Fine / Normal - This determines the quality of the still images taken by the camera; S. Fine is the best, while normal is the lowest quality. Meter Mode Setting - Center / Average / Spot - This is referring to the method in which the camera determines the optimal exposure. Most users should leave this on default. Light Freq - Auto / 60Hz / 50Hz - Choose the correct frequency for the power line to avoid flickering. Date Stamp Setting - On/Off - Allows the user to stamp the date and time in the video. Handy for insurance purposes, less important for personal use. ADAS Detect - On / Off - This will turn on/off the three driver assistance systems. Lane Departure Warning System - If lane changing occurs, a warning picture will appear and a beep will warn the driver. This is mainly used for motorway driving, as overtaking parked cars in rural areas and towns will trigger the sound. Low Light Warning System - This will detect the amount of light, and remind you to turn on the headlights in low-light conditions. 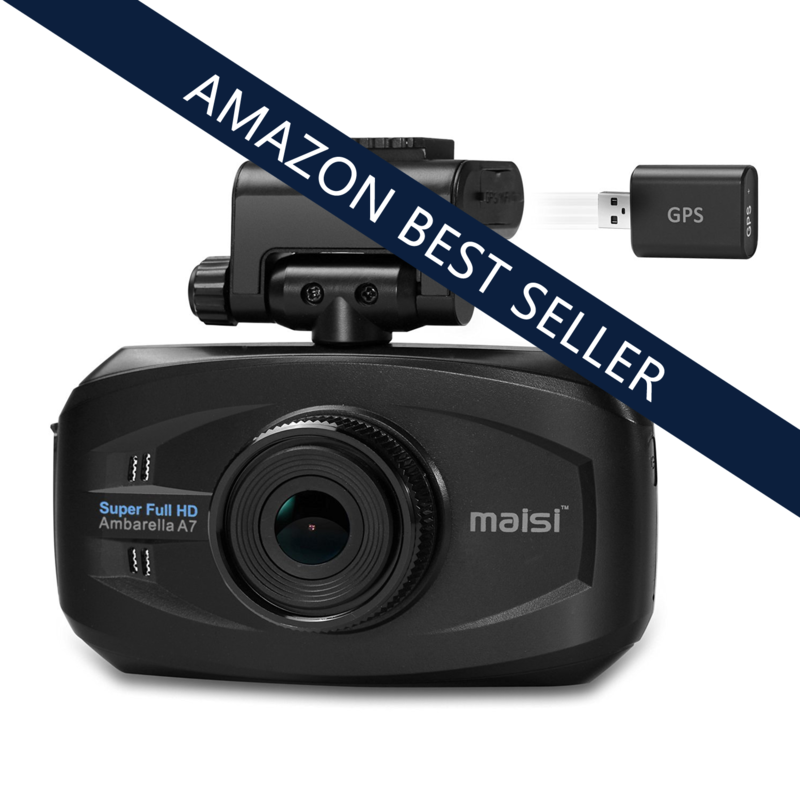 Driver Fatigue Warning System - The Maisi Smart dash cam will send a warning picture and warning tone to the driver when continuous driving (more than 4 hours) is detected, followed by the same tone every two hours. In our opinion this is a fairly useless feature, as the length of time between warnings is too long to have an impact. If you are driving for several hours, we recommend taking regular breaks at service stations. Loop Setting - 1min/3min/5min - When the camera locks footage it will save a loop and protect it. When the microSD card fills up, it will begin overwriting footage that hasn't been protected. It is entirely up to you what loop length to choose, 1 minute might be too short to pick up the start of an accident, while 5 minutes may fill your SD card quicker, as longer loops are being saved. We usually use a loop length of 3 minutes. TimeZone - +/- 12 - Allows you to set the time zone for different countries, not a very important feature. AE Bias - +/- 2 EV - Adjusting this setting will make the footage or snapshot brighter or dimmer. SpeedWarning Setting - Off / 80KMH / 120KMH - The device will warn the driver when a certain speed is reached. As this is only set in KMH and a wide variety of speed choices aren't provided, this isn't a particularly useful feature. LED Setting - On / Off - Turns on or off the LED at the front of the dash camera. Motion Detection - Off / On - While motion detection is turned on, the camera will automatically record when it senses movement. Be warned though, as the camera battery life isn't very long you will need to hard wire the camera to the car to make the most of this feature (unless the 12V socket is always active). However, we recommend removing the dash cam or putting it out of sight each time you leave the vehicle unattended, as they can be attractive to thieves. One of the best uses of Motion Detection is while using the Maisi dash cam as a surveillance camera in the house. If you would like to do this, we recommend formatting the microSD card first, as they can fill up very quickly when using this feature. Be careful not to leave Motion Detection on while using the camera as normal, as this will start and stop recording at seemingly random times. This is one of the most common "faults" with the camera, so make sure this feature is turned off if you are having problems. Record Mode Setting - Auto / Manual - "Auto" will begin recording when the camera is powered on, while "Manual" will require the user to start and stop recording. Switching to "Manual" can make it quicker to enter and exit the menus (as you don't have to stop the recording each time you enter settings mode), but remember to switch back to "Auto" once the camera is set up. Backlight Off Setting (screen saver) - Off / 1 Min / 3 Min / 5 Min - The display will automatically turn off after a set amount of time. Please note, the camera will still be recording while the screen is black. 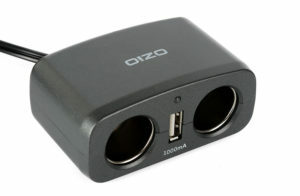 Delay Power Off - Off / 15 Sec / 30 Sec / 1 Min - The dash cam automatically switches off after a set amount of time. Beep Sound Setting - On / Off - Turns the beep sound on or off. 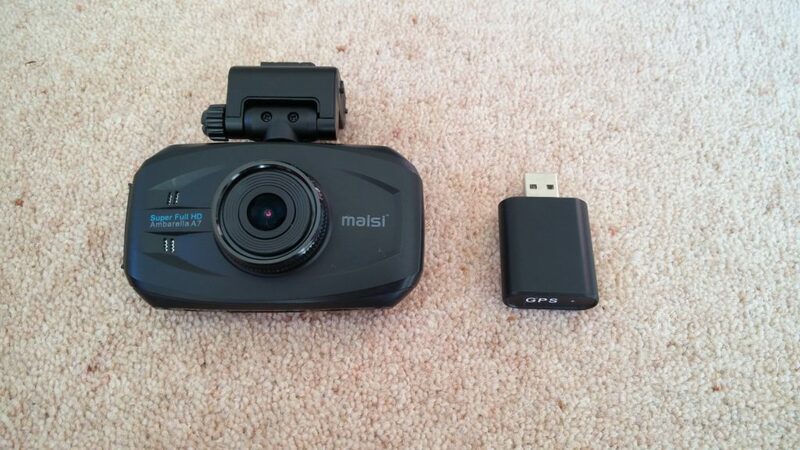 We have added footage below of the Maisi Smart dash cam in use. For this test, we have attempted to cover as many driving conditions as possible. These videos are linked from Youtube, so clicking on the screen icon in the bottom right of the video will allow you to view the video in full screen mode. Unfortunately Youtube's compression makes the video quality seem worse than it is, so bear this in mind while watching. Maisi Smart Daytime Footage - This video contains both moderate and bright light conditions. As you can see from the videos, the day footage is excellent, allowing you to pick up finer details such as number plates. The 170 degree wide angle lens gives fantastic coverage of the entire road, and the surrounding area. The low light footage is good enough for purpose, but as with most dash cams, the Maisi loses much of its clarity when driving at night. We recommend using the 1920 x 1080 HDR resolution option, as this offers the best compromise between video quality and file size. The highest resolution (2k) setting looks fantastic, but the two major drawbacks are a) Most monitors can't display the resolution to it's full potential, and b) The video files are very large, filling up the microSD card quicker. The 720p @60fps setting is also a great option, but sacrifices sharpness for a smoother video. To play back files on the Maisi Smart dash cam, you will first need to go into "Playback Mode". To do this, press the OK button to stop the current recording, then press the Down button twice. From here, you can press the Up/EV button to switch between protected and unprotected files. Press the OK button to begin navigating through the videos, which is done with the Up/EV button. This part can get very frustrating, as the Down button will take you back into recording mode, meaning you can only navigate in one direction. Now press OK to load the selected video, and press it again to play. The Up/EV button will take you to the next video, while Down will take you back to the previous screen. Pressing OK will pause the video. To delete a file, navigate to the video and press the bottom left button. Use the Down button to select delete, and OK to view options to delete the current video, or delete all. Press OK again to confirm your selection. There are two ways of getting the recorded footage on to the computer. 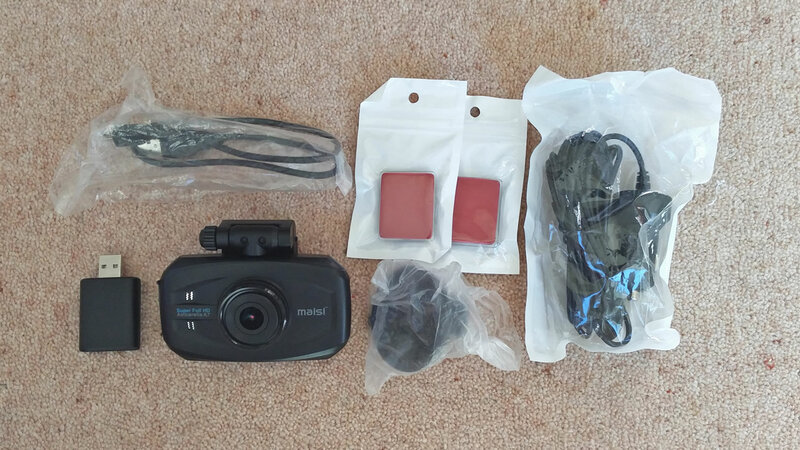 The first method is to connect the dash cam to your computer with the supplied USB cable (you will need to plug into the USB slot on the camera rather than the DC IN). When you plug the camera in and turn it on, the screen will be blue and say "USB connecting". This will allow the files on the dash cam to be accessed through your computer. It should be labeled as "Removable Disk". When I was transferring files on low battery, the dash cam was continuously beeping until the screen turned black. I assume this allowed the battery to charge, as the files could still be transferred in this "power saving" mode. Even if this was the case, the constant beeping became very annoying, so I recommend transferring files while the battery is charged, or turn the beep sound off to save you a headache. Access the Removable Disk and simply copy the files you want, then paste them over to a folder on your computer. The Removable Disk contains three folders; EVENT, NORMAL, and HDPlayer. The EVENT folder is where you will find the protected recordings, the NORMAL folder contains the other recordings, and HDPlayer contains a 7z file of the Maisi HDPlayer. This program allows you to see the GPS and speed data with the recordings, but it can be very difficult to install. To begin with, you will need a program such as 7-Zip to extract the file. Once this is complete, you will need to run the program, but it is worth noting the HD Player only works on 32-Bit operating systems (most are 64-Bit). It is also worth noting my antivirus software (Avast) detected the program as malware. Read the section below for tips on using this software. Access the Removable Disk and simply copy the files you want, then paste them over to a folder on your computer. It can be a good idea to reformat the microSD card after transferring files over, to prevent file corruption. If you are going to do this, make sure to copy over every file you need, as they will be deleted when the microSD card is reformatted. An alternative method is to make sure the dash cam is switched off, then remove the microSD card. 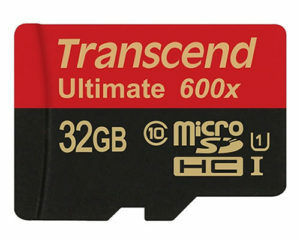 This card can be inserted into your laptop or computer, with the use of an SD card adapter. When the SD card is plugged in, your computer should notify you. Open up the folder and simply copy and paste the files over, the same way as the previous method. After the videos have been recorded, you can play back the files while watching GPS tracking on a map, using certain software. We had quite a few issues with the included software; the antivirus software detected it as a threat and wouldn't allow me to open the program, and when the program was opened on another computer, GPS data wasn't being displayed (due to 64-bit OS). For this reason, we recommend windows users download a software called Registrator Viewer, as this worked perfectly with all of the videos. If you would like to try the included software, here is what you need to do. When the camera is plugged into your computer via the USB slot (not DC in) you will see a folder titled "HDPlayer". Copy this to your computer. For the next step you will need a program such as 7-Zip to extract the file. Once this is complete, you should to run the program, but it is worth noting the HD Player only works with GPS tracking on 32-Bit operating systems (most are 64-Bit). It is also worth noting my antivirus software (Avast) detected the program as malware, but I believe this was a false claim. Both video players look identical, with a map in the top right, and a list of videos underneath. The video takes up most of the screen, and other data is included below (G-force/speed). Videos are automatically imported, so the first thing I recommend you do is highlight every video at the bottom right, and click the green "-" button above. This will remove all the videos from the list, so you can use the green "+" button to add the Maisi footage. When this is done, you simply click on a video to load it into the player, and press the play button to begin. As stated earlier the Maisi Smart dash cam footage looks great when set to the highest resolution, but file size can be a major downside. For this reason we recommend recording at 1920 x 1080 HDR, as this resolution can be displayed on the majority of monitors. The High Dynamic Range helps the camera provide a great video, without taking up too much space on the microSD card. 720p @60fps is a great alternative choice for those who value frame rate over resolution. The Maisi's screen quality is also worth noting as particularly impressive, and the dash cam handles direct sunlight incredibly well. The GPS tracking is a fantastic bonus, if you can get the software to work. 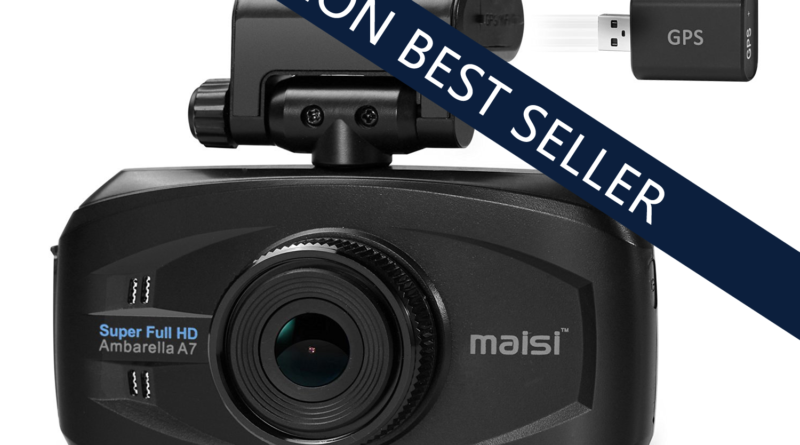 In the mid range price bracket, the Maisi Smart is our current favorite, and we even prefer this to some high end dash cams. The Ambarella A7 chipset allows the highest resolution you will find in dash cams currently on the market. The video quality is great during the day, and at night the footage is good enough for purpose, even to use as a home security camera (with motion detection). The 170 Degree Wide Angle lens covers the entirety of the road, allowing you to record everything in front and to the sides of your vehicle. 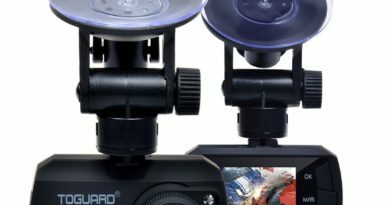 The suction and adhesive mounts offer either a temporary or permanent fix to the windscreen, and the suction cup allows you to easy adjust the cameras position. Setup can be a little fiddly, and the buttons aren't as easy to press as other dash cams, making it particularly inconvenient when manually locking footage. Another slight negative is the frustrating camera playback, as pressing the wrong button can take you all the way back to recording mode. The advanced settings can only be turned on or off as a collection, so you can't have LDWS on while Driver Fatigue is off. Lane Departure Warning System should only be used for motorway driving, as it can get annoying when overtaking parked cars or avoiding pot holes. We would also like to see the Driver Fatigue system to alert more often, such as once every hour. Footage cam be shaky at times, but this will likely be influenced more by your car's suspension. When testing out the camera, the screen became unusually warm after around 10 minutes of use. However, we continued to record for an hour without experiencing any problems as a result, so don't be alarmed by if your camera does the same. In the videos we noticed very unusual rattling sounds coming from the camera, with both the suction and adhesive mounts, and the audio from this camera is fairly poor. The final point I would like to make is regarding the auto record. This isn't a problem with the camera, but we strongly recommend turning off auto record when altering settings, as it requires you to stop recording before entering the menu. Remember to turn this back on when you have finished. I also recommend changing the auto-off setting to 15 seconds. As far as improvements go, we always like to see more dash cams come with microSD cards included, to avoid the extra cost, and confusion about which to buy. This is particularly important with the Maisi Smart, as purchasing the standard class 10 microSD may not be fast enough to record at the highest resolution. Apart from this, the Maisi has everything you need in a mid range dash cam, and is good enough to rely on as evidence if an incident was to occur. If you are willing to sacrifice the GPS and advanced features for a lower cost, you should consider the Maisi Full HD. 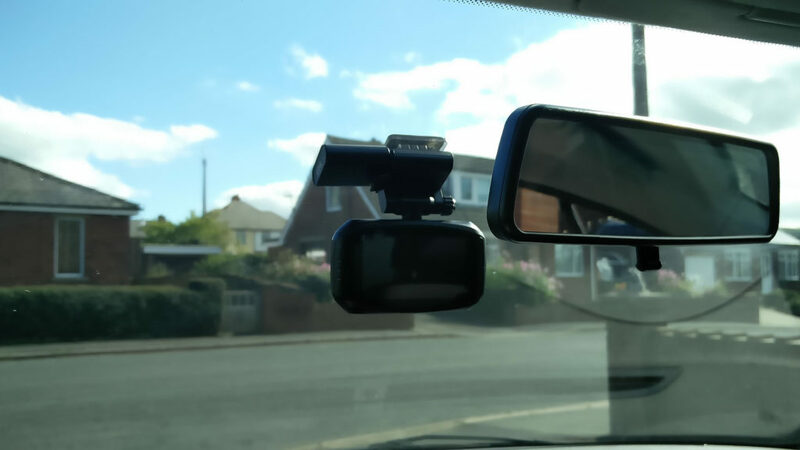 This dash cam features the same resolution options, but is a slightly stripped back version. For an even lower price, the Rexing V1 can provide you with great 1920 x 1080 footage, and a more discreet design. The Rexing V1 also feels more robust, particularly when pressing buttons, and provides fewer frustrations than the Maisi dash cam. 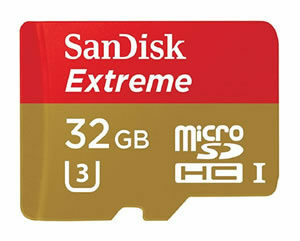 SanDisk Extreme 32GB Class 10 - This microSD card has a superior write speed, allowing it to store high resolution video footage. Make sure to purchase from a reputable seller rather than a third party vendor. If you aren't interested in 1296p recordings, the Transcend Ultimate uses superior NAND flash (MLC rather than TLC), offering greater reliability and longevity. 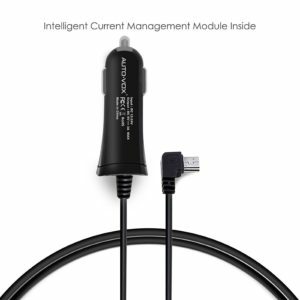 Dash Cam Cable - This cable should be suitable for the Maisi Smart Dash Cam as a spare or additional wire, with an additional USB slot. 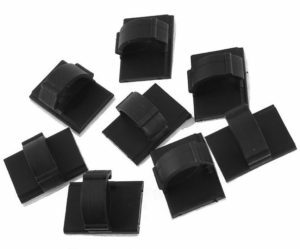 Self Adhesive Cable Mounts - These mounts will allow you to fasten the cables underneath the glove box of your car, providing easier cable management. Cigarette Lighter Splitter - This cigarette lighter splitter will turn your single socket into two sockets, with an additional USB slot for charging phones. This is a must buy for drivers using both a dash cam and a sat nav. Finally, a dash cam review written by someone who has actually used the camera. I bought this a while ago when it was £64.99 and I agree with pretty much everything you’re saying, except with the video quality. I’d like it to be a little bit clearer, but the other features more than make up for it. The dash cam has been faultless so far so I haven’t had to contact the support team, but I hope they are as good as you say. The Maisi Smart instructions are very easy to follow. Great work on the sd card and set up guide as well, I would have saved a lot of time had I found this article earlier. One question, it seems like this camera is a Chinese model, what are your thoughts on dash cams imported from Asian countries like China? Hey Pete, thanks for the comment. Nowadays most electronic products are manufactured in China, so don’t let this put you off. Quality control can sometimes suffer slightly, but prices are greatly reduced as a result of importing. Just be cautious when looking at anything under £20, it will usually be poor quality and probably won’t last a year. I’ve actually looked for dash cams on Alibaba myself, so I recognise the same models appearing on Amazon again and again with different branding. The Maisi is pretty unique compared to these models, and is certainly a well built piece of kit.